The Uganda Safari Company (TUSC), operating since 1993, is a Destination Management Company (DMC), offering a full service for high-end safaris in Uganda. We are a part of Wildplaces Africa that is owned and managed by people with a true love for the country and a deep-rooted commitment to the preservation of Uganda’s wild places. The Wildplaces Africa group also comprises three high-end properties: Apoka Safari Lodge (Kidepo Valley National Park – Northern Uganda) | Clouds Mountain Gorilla Lodge (Southern Bwindi – Western Uganda) | (Semliki Valley Wildlife Reserve – Western Uganda). For our property portfolio, we sought the pockets of Uganda that still remain wild and secret. In these tracts of glorious wilderness we have built small, fantastically comfortable safari lodges and camps. At our properties you won’t be jostling for space at the buffet table, you won’t be queuing with other vehicles for a glimpse of a lion or a herd of elephants. We focus many itineraries around the Wildplaces Africa properties as they are of the finest quality in Uganda, but also contract with other top accommodation suppliers in Uganda that meet our standards and expectations. 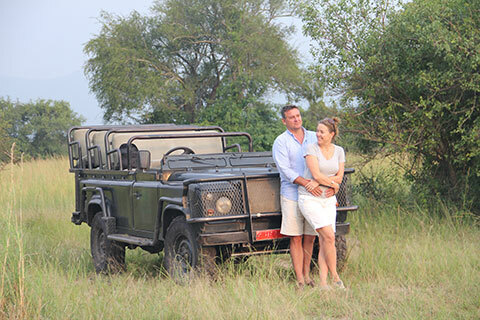 Conducted by our talented safari guides in comfortable vehicles or combined with charter or scheduled flights, TUSC personalises safaris to combine luxury, style, service and authenticity to provide wonderful adventure, outstanding scenery and an unforgettable experience. We focus on exclusive, high-end, individualised travel… Gorilla tracking, walking safaris, photographic safaris, balloon safaris, helicopter safaris, birding safaris… cultural tours, hiking expeditions, fishing safaris, working holidays…Our main office is situated in Bugolobi, Kampala, a leafy suburb a little away from the hustle and bustle of the centre of town. This is our hub, where all reservations, marketing, vehicle maintenance, accounting, purchasing and other logistics for the group take place. The passion and dedication of the team is palpable when visiting our office; and many a day and night is spent strategizing and planning together, with the sole focus of promoting tourism to the country we love. After building their first lodge in Western Uganda, the safari business was launched from a desk in the garage of Jonathan and Pamela’s Kampala’s home. But we need to go back several generations to see that the Wright family has a long history with East Africa.From Ethiopia in the late 1940’s to Uganda in the 50’s, the call to the continent has been very strong. Safaris, camping, bush lore, wildlife, the open skies…it is in their blood. Jonathan was born in Jinja, (then a small town at the source of the River Nile) and went to school in the Highlands of Kenya. Despite being sent later to a boarding school in the UK, and the family leaving Africa to settle in a Norfolk seaside village, he vowed one day to return home to Uganda where he belonged, where he could wander barefoot year-round. Waylaid temporarily by University in Canada and a stint in insurance in London, return home he did, in the mid-1990s, with his Canadian wife Pamela and their two children under the age of 2, Annabelle and Fergus. It’s a long story, but the short version is this: it was a toss-up between moving to Newfoundland, or moving to Uganda. Uganda won, and here they still are. Over the years they slowly built up The Uganda Safari Company and its holding company, Wildplaces Africa. Pamela moonlighted as a consultant and freelance writer while looking at the softer side of the company, while Jonathan ran the operations, galvanized teams of builders and guides and sat for a 3-year term as a Director on the board of the Uganda Wildlife Authority. He remains an Honorary Warden to this day. The company has certainly grown since the early days when the two of them ran things alone out of the garage. Now there are over 160 working in the company. They have since built their home in the bush where they live with dogs, cats, chickens and a goose. Annabelle and Fergus are at University in Canada but come home as often as they can. Jonathan continues to galvanize the team, and Pamela is currently the Honorary Consul for Canada.